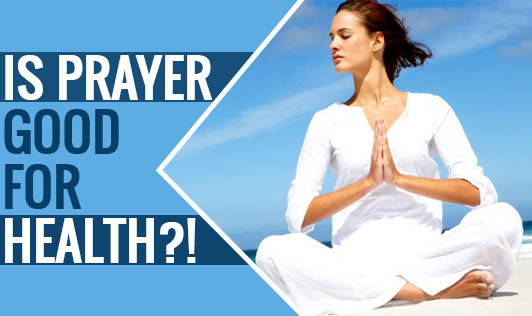 Is Prayer Good For Health?! Irrespective of the religion we follow, irrespective of whether we believe or do not believe in the supreme, at some given point in life we all pray for assistance. There are many testimonials to support that prayers work! Most of us out there would have experienced it ourselves. In recent times, there is lot of evidence to prove that prayer has a lot of benefits on our health. Did you ever think that prayer can contribute to good health and help cure you from major illnesses? Prayer has a subjective meaning arising from an individual`s religious practices. For some, prayer can be chanting sacred words, while for some it can be an informal way of talking, and for some it could be a way of unburdening. It is believed that prayer is the act of raising hearts and minds to a higher power. How can prayer benefit your health and wellbeing? As prayer is so widely used, it is important in health care. Surveys show that nearly 90% of patients with serious illnesses engage in prayer for alleviation of their disease. Praying is the single most widely practiced healing and pain management modality. • Positive feeling: Prayer can bring in feelings of hope, gratitude, compassion, and forgiveness all of which are associated with healing and wellness. • Mind, body spirit connection: When praying calms the body, it inhibits the release of cortisol and other hormones that have a negative impact on the immune system and thus promotes healing. • Relaxation: Prayer is a way of relaxation that helps to lower blood pressure and other factors heightened by stress. • Secondary control: Prayer releases the stress of needing to be in charge to something greater than self. • The placebo response: Prayer enhances a person`s hope and expectations that can have positive impact on their health. What does research say? There are several studies to correlate prayer with improved health and wellbeing. A study by Dr. Herbert Benson, a cardio vascular medicine specialist at Harvard Medical School in his well noted study documented the potential health benefits of spiritual practices like prayer and meditation. On the whole, we must remember that "Health is a state of physical, mental and social wellbeing and not merely the absence of disease or infirmity". So let`s take care and pray for our good health!